Oprah may have dropped the ball on this one. Mukami Kinoti-Kimotho is an “on-air personality, journalist, organizational ambassador and celebrity spokesperson” based in Washington, DC. Last year, she had the opportunity to compete for a spot on Oprah’s OWN network. She didn’t win, but that hasn’t stopped her from seeking to become a media mogul. Mukami’s own multimedia company, MaWazo Media, will launch their first season on May 12th at 4pm EST (that’s this Thursday). Mukami will tweet the event live from her account (@MukamiTV) using the hashtag #MukamiTV. Subscribe to the MukamiTV YouTube channel, mark your calendars, and be sure to check out the first episode of the season this Thursday. After Apple shut down their online store for a while, many assumed it was in anticipation of an iMac refresh. Those rumors turned out to be dead on. Pricing for the new iMac start at $1,199 for a 21.5″ model with a shiny new 2.5GHz quad-core Intel Core i5 processor and 3x faster graphics. These new iMacs also feature a Thunderbolt port and a FaceTime HD camera. Shipping time is 24 hours. The basic all-in-one design is the same, but these bad boys are now packing some serious heat. The Google Chrome team is doing their part to reinvigorate the It Gets Better Project, which has been around since last September. A few weeks ago, a video circulated featuring Apple employees sharing personal message for the project. Now, the Google Chrome team has done a similar video. This is not the first time Google has taken part in the project, as several Googlers were featured in a video back in October. Even Obama has done his part to support the It Gets Better Project in a video. Sprint and Google are finally rolling out integration with Google Voice. This allows you to route your calls through Google Voice using your Sprint number or a Google Voice number. Very convenient, but many are having serious issues. Some Google Voice accounts have become completely crippled. Many are not able to activate the GV account with Sprint at all. Some international calls are not being routed through Google Voice, resulting in serious fees. At least one user tried to deactivate the integration and now, when he makes calls via Google Voice, the person he is calling ends up in his voicemail with full access. Google Voice has been my primary phone number for over a year now and I haven’t had any problems since integrating with Sprint, but I’m keeping my fingers crossed and knocking on wood. It seems that scammers have found a way to infiltrate Google search to push malicious software to visitors. Many have complained about Google Image search results directing them to pages that prompted them to download anti-virus scareware via misleading error messages and alerts (ie. Your computer is infected! Click here to fix!). According to SANS Internet Storm Center, these attackers have been able to distribute malicious scripts across an unknown number of sites which populate the pages based on topics from Google Trends. These scripts than grab images from other sites which makes them look legit in an image search. A Russian malware researcher, Denis Sinegubko, says this is “the most efficient black hat trick ever,” and added that it was very simple to set up. Sinegubko says about 5,000 sites have been hacked, with the average site containing 1,000 of these bogus pages. This results in Google sending 15 million visits to these sites every month. Sinegubko is developing an add-on for Firefox that can flag these evil Google Image search results by placing a red box around them. You can also protect yourself by using an add-on like Noscript, which restricts what sites can run scripts in your browser. Similar add-ons exist for Google Chrome as well. CNET reports that a third attack has been planned against Sony. According to an Internet Relay Chat user frequenting a channel used by hackers, the attack is planned for this weekend. Their plan is to publicize information whole or in part that was copied from Sony’s servers during a previous intrusion. Should the planned attack succeed, it would be the latest blow in a series of devastating security breaches of Sony’s servers over the past month. The failure of Sony’s server security has ignited investigations by the FBI, the Department of Justice, Congress, and the New York State Attorney General, a well as data security and privacy authorities in the U.K., Canada, and Taiwan. Several weeks ago, Anonymous targeted a number of Sony sites with their “patented” distributed denial-of-service (DDOS) attack. Their members feel that Sony acted unfairly against hacker George Hotz. Later, another attack resulted in personal customer information being exposed for millions of Sony customers. This forced Sony to shut down PSN, Qriocity, and Sony Online and they are still working to bring theses services back online. Sony doesn’t know who orchestrated this last “highly sophisticated, planned” attack, but are hinting around that it may have been Anonymous. The group denies any involvement in the breach, though. They’ve issued a statement denying it was involved: “While we are a distributed and decentralized group, our ‘leadership’ does not condone credit card theft,” the statement said. Reuters reports that “wo sources with direct knowledge of the discussions” say both Facebook and Google are separately mulling over a merger with Skype. This comes after Skype decided to delay its initial public offering. These sources say Facebook CEO Mark Zuckerberg has taken part in discussions regarding a Skype acquisition, as well as reaching out to Skype about a joint venture. One source says Google has been in early talks for a joint venture with Skype as well. Although an IPO is still in the cards for the second half of 2011, Skype remains in discussions with other companies, two of the sources said. If it goes through, a Skype IPO would be one of the most hotly anticipated debuts by a U.S. technology company this year. While Skype’s IPO is expected to raise about $1 billion according to several sources, a deal with Facebook or Google could be valued at $3 or $4 billion according to one source. Skype is very popular, boasting 124 million users last year, with 8.1 million being paying customers. The problem for them is that both Google and Apple have stepped on their toes, along with a number of other smaller companies. As the competition heats up for video calling, Skype’s value in an IPO drops. Investors are also worried about the huge number of non-paying users Skype carries. Analysts say that a merger with Facebook might make the most sense as Google already does video and voice calls. Both Facebook and Skype stand to gain a lot from such a partnership. Facebook would expand its portfolio of social features while gaining ground on Google due to the sheer number of Skype users. Facebook is also a standard application on most smartphones. “In your social network, you will now have another very compelling service — Skype,” he added. Skype has already changed hands a couple of times and it looks like a merger or acquisition may be best for their future in this case. What do you think? Mobile Web Ghana had their first awards ceremony. A jury decided which of ten projects which entered the competition would win one of two prizes donated by Vodafone Ghana. The race started with a training program, which ran from February 24th to March 19th. A novel and/or practical integration of Web technology, as taught during the training session. the quality of the presentation, and the team’s ability to pitch its project in a limited amount of time. First prize GHC10,000: Music Request Service, by Alfred Anyan, Gerald Abraham and Martin Zonyrah. A mobile service designed to provide an easy and cheap means for people to request and share their favorite songs using their mobile phones. Second prize GHC5,000: Mobitix, by David Agbenyega, a mobile application that allows mobile users to buy tickets and event organizers to issue tickets, monitor their sale and validate them. The winnings will be used to build businesses around the winning projects. All projects, even those who did not win, will be provided with further business mentorship and helping accessing capital and providing media exposure. According to a study commissioned by digital agency Beyond, Only 17% of mobile users check-in using social location-based services like Foursquare and Facebook Places. While 48% of those avoiding these location-based apps did so because of privacy concerns, 50% just don’t have a smartphone to check-in with. 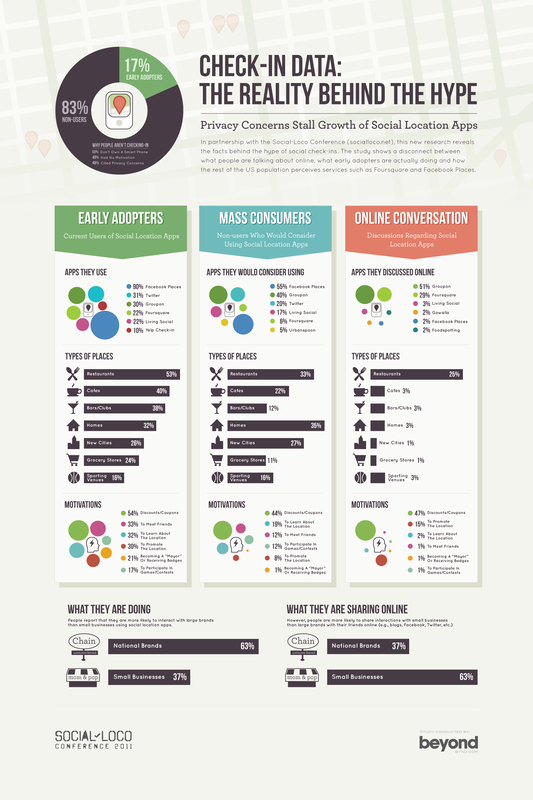 Facebook and Groupon are apparently well-trusted by many mobile users. While 90% of those who actually checkin on their mobile devices said they did so on Facebook Places, 40% who had never checked in said they would consider sharing their location with Groupon. Note that this doesn’t necessarily mean they want to share their location on a social network, but may be interested in getting discounts based on location. On the same note, 54% of users who check in saying they are motivated to share their location when it involves getting a discount. All those fancy badges and stuff offered by services like Foursquare and Glue? Only 21% of active location sharers are motivated to check in to get them. A staggering 99% of users who don’t yet use checkin apps said badges and status would not motivate them to share their location. Living Social, Twitter, and Groupon all outrank Foursquare when it comes to non-users, with only 6% saying they would consider using Foursquare. Even among early adopters of location apps, Foursquare comes in 4th with 22% of users saying they use it. After discounts and coupons, both early adopters and non-users of location apps seem to agree that meeting friends and learning about a location are next on the list as motivations to check in. Very useful data for those in the location game and highlights the fact that simple gaming and badges alone won’t cut it for these services to succeed. responsibly works like your average daily deals site, except that 100% of the proceeds is donated to education. You choose which education project you want to donate to. 50% of the proceeds for the purchase go to the school with another 50% matched via corporate sponsorship from Donor’s Choose. “The education system is in dire need of our help, and we want to start a movement that spreads awareness, brings people on board with our mission and gives them a really easy way to help directly and contribute to saving America’s education,” said Grant on the motivation behind the startup’s for profit mission (they take a cut of sales). The actual deals are sparse. Right now, you can only buy aromatic Stone Candles, but these offerings will be expanded during the beta period. Their tour bus is a rolling home office, featuring solar panels and customized fold-out beds. They just came off a 15 city tour during the month of April, visiting schools and leaders from the KIPP, Greendot, and Teach for America programs across America. The goal here is to show they are committed to their cause and to get a better idea of the issues faced by US educators so that they can find the best ways to help. “Our goal is to be more than a simple commerce platform – we want to connect consumers and companies with charitable giving in an easy and cost-effective way that benefits everyone,” said Felkner. It turns out, that these are not actually MLK’s words. The Atlantic did some digging and could find no place where King either spoke or wrote these words. Real or not, the quote blew up across the social web with no credit going to the individual who wrote it, which begs the question as to why anyone would do such a thing. All but the first sentence here is from King’s book, Strength to Love. The first sentence was written by a Facebook user name Jessica Dovey. She posted the update and added on the MLK Quote, but someone later modified the post and removed the quotation marks. The first sentence here, not MLK’s words, eventually spun off on their own and ended up being retweeted by none other than Penn Jillette from Penn and Teller. From there, his 1.6 million followers did the rest. In 24 hours, the quote showed over 9,000 hits on Google. In this case, it’s a harmless quote, but it’s easy to see how any false information could spread in the same way. This is illustrated further by the preponderance of death rumors regarding various celebrities. The news of Osama’s death and this fake quote show how quickly social media can spread information, but it’s up to us as individuals to verify that information. Twitter Blocks UberMedia. Buys TweetDeck For Around $50 Million. More rumors are swirling today about a Tweetdeck acquisition. This time, it’s Twitter buying the popular client for $40 to $50 million. According to TechCrunch, the rumors are being confirmed by “a source with knowledge of the deal,” but has not been confirmed by Twitter or Tweetdeck at this time. Twitter has acquired TweetDeck, we’ve heard from a source with knowledge of the deal, and the transaction will be announced in the next few days. The $40 million – $50 million purchase price includes both cash and Twitter stock, says our source. It seems that Twitter may have been forced into buying TweetDeck because of UberMedia, who was also looking to acquire it. Ubermedia’s Ubersocial Twitter client is the 3rd most popular while Tweetdeck is the 4th. There was talk last month that Ubermedia was planning to create a Twitter competitor. This isn’t that far-fetched given their popularity in the Twitter ecosystem, and acquiring TweetDeck would have created serious problems for Twitter. This scenario is confirmed by sources close to the matter. Twitter absolutely could not let Ubermedia gain any more leverage over them. The power is in the user base and Ubermedia would have had too much control over a large number of Twitter users. Check out TechCrunch EU for a rundown of possible scenarios. Many of us will remember these days for the rest of our lives. Some will remember exactly what they were doing at the exact moment that they heard the news. Others casually passed the information around without a second thought. While each person may have taken the news of Osama Bin Laden being found and killed at the command of President Barack Obama, one thing is clear: the news spread like wildfire via social media. In less than 12 hours since the tweeting began we saw almost 40,000 blog post and news articles and an astounding 2.2 million tweets all talking about Osama Bin Laden. As well, while no surprise that people in the US were talking the most about this event a look at our geo-location map shows us that people all over the world were tweeting about the news. Not only did the news itself spread quickly, but even jokes about the event caught on and spread rapidly. Many people began checking into Foursquare at the place where Osama was killed while others began checking into a “Post Osama Bin Laden World.” By this morning, Levine found 11,570 tweets that made reference to Foursquare and Bin Laden or were check-in’s related to Bin Laden. Important to note here is that, while services like Twitter were instrumental in spreading the news, social media doesn’t seem to replace the news. As TechCrunch points out, Twitter was used to amplify the news, but the source could usually be traced back to a traditional news source. Of course, there are always the rare cases where someone beats traditional channels, like the guy who unwittingly live-tweeted the raid on Bin Laden. Personally, I was deep in an MMO when the news broke. I had just upgraded the wife’s NOOK Color and she was checking out the new apps available. Then, after checking her Facebook, she said everyone was posting about Osama Bin Laden being killed. The next thing I knew, my show was being interrupted for a Special Report. What were you doing when it all went down? Central.ly is a service which helps to “make your business a big splash on the web.” Currently in private alpha, the service makes it easy to create a beautiful and personalized page for your business that will attract customers. These pages cut out the clutter and focus on eye-catching images and your social media accounts. Brain child of Chris Bennett, Arrel Gray and Edward Robertshaw, they claim that Central.ly can build a new web page in five minutes. Not surprising given the simplicity of the designs, but this very simplicity may be the secret to success. The pages focus on large images with very little content. The focus is in prominently featuring links and content from social networks like Facebook, Twitter, Yelp, Linkedin, and Foursquare. Central.ly claims to provide the best hosting tools for reasonable prices. They also provide access to analytics tools so that you can track your page’s performance and figure out where visitors are coming from as well as where they end up going. These dedicated pages make locating your business on the web easy and integration with your social media accounts may help to keep your site up-to-date with minimum work. There are others in the game of creating simple and beautiful landing pages with social media integration, but Central.ly seems laser-focused on the business niche. It would be a great service for businesses and brands who need a basic home on the web, but primarily engage potential customers through social media. Besides analytics, Fudzology is also working on SEO, new media tools, and SEM to improve your pages. While the service is in private alpha, you can still sign up to reserve your brand or company URL and receive a notification when your site is ready to be set up. As is the trend these days, inviting some of your friends to also sign up for the private testing period will get your access sooner. News Corp paid $580 million for MySpace back in 2005. It seemed like a good idea at the time, but Facebook has since taken the spotlight. Now, according to The Wall Street Journal, News Corp. is seeking bids for no less that $100 million. Potential buyers include private equity firm Thomas H. Lee Partners, Redscout Ventures and Criterion Capital Partners LLC, owner of social networking site Bebo. MySpace attempted to reinvent themselves, but it looks like they just couldn’t turn things around. Between April 17th and 19th, Sony noticed there was an “illegal and unauthorized intrusion” on the Playstation Network. It was not until the 26th that users were finally alerted about the intrusion. Sony explains the delay on the Playstation Blog. For more details about the breach, there is a FAQ. The Barnes & Noble NOOK Color has been considered to be a junior Android tablet since it’s launch. Many have already rooted the device to open up the possibilities for it’s use beyond an advanced ebook reader. Now, with the latest update, your average NOOK owner gains access to more than 100 select applications across a broad range of categories. Yes, Angry Birds is included, along with a few choice apps like my6sense and Pulse. The whole Android Market is not included, but this may be easier to manage for your average NOOK user while still making the device infinitely more usable. Twitter Changes OAuth Screen. Passes 200 Million Accounts. You may have authorized an application to access your Twitter account before by hitting a “Sign in with Twitter” button. Usually, you get a simple screen telling you the name of the app that wants to access your Twitter account along with the Allow or Deny buttons. Now, Twitter is tweaking this exchange so that you get a better of idea of exactly what the site you’re authorizing will be able to do. On another Twitter note, they’ve now passed 200 Million registered users worldwide. Google has finally launched an official Google Docs Android app. What you may want to know up front is that you can’t actually edit documents using the app. Whenever you open a document for editing from the app, it jumps to the web browser. So, why would you want this app? It’s the deep integration of your documents with your Android device, including the ability to upload content from your phone and open documents directly from Gmail. I’m sold right there, but you can also add a widget to your home screen for easy access to three basic tasks: jumping to your starred documents, taking a photo to upload, or creating a new document with one tap. The most exciting feature, though, is Optical Character Recognition. Take a picture of a document and the Docs App will convert the image into an actual, editable, document. Using the app and your phone’s camera, you can turn photos with text into editable Google documents with the power of optical character recognition (OCR). Just create a new ‘Document from Photo’ or select the camera icon from the widget, and your converted document will appear in your documents list shortly after you snap the picture. You can also convert photos already stored on your phone by sharing them with the Google Docs app. OCR does a pretty good job capturing unformatted text in English but won’t recognize handwriting or some fonts – stay tuned, it will get better over time! FindLikes is a service that lets you find music and videos that you like based on what you’ve liked on Facebook. Not only does FindLikes find your own Likes from Facebook, but it pulls in all the stuff your friends like. This is a great way to expand your horizons and get direct referrals and recommendations from your friends. When you first hit FindLikes, you’ll need to connect your Facebook account. This pulls in all the Movies, Music, and TV Shows from your profile that you’ve said you like. These show up as a grid of thumbnails organized by category. Clicking on any thumbnail brings up a list of videos related to that subject. For instance, if you said you liked Tupac, You’d get a huge list of Tupac-related videos. These play continuously if left alone, but you can also choose which video to play from the list. You also have the option to save the video you’re watching for later, which adds it to your personal playlist. The Facebook page related to what you’re watching shows up on the right. If you prefer YouTube and have a new channel our you are just trying to grow your channel you can now buy youtube views. Now comes the fun part. You already know what you like and now have access to just about as much video as you could shake a stick at on those topics, but what if you want to branch out? If you jump over to the Movies, Music, Videos, or Photos tab, you can do just that. These all show stuff your friends like, which could lead you to finding something awesome. Hitting a topic on these pages lets you browse the related videos, see which of your friends Like it, and you can hit Like yourself if you find something cool. FindLikes is a great concept and definitely has potential. There are a few odd quirks about the interface, but these are minor. For instance, clicking on a Liked item opens up the list of media in a new window. There is no way to get back to the main FindLikes site from this new window as the huge FindLikes logo at the top links to the Facebook page. I also noticed that your Facebook connection can time out after a while, requiring you to login with Facebook again. Overall, the service is awesome and worth a look. Users have watched well over 4500 hours of video on the site. Founder Dexster Smith is a serial entrepreneur who previously served as President and Co-Founder at Doubletwist, Digiscents, and Upstream Biosciences. It was inevitable with the ridiculous growth of Android. Apple currently still holds the title for largest app store, but that will change in just a few months. This info comes as part of a report from Distimo. By the end of June 2011, Distimo expects the Android Market to have about 40,000 fewer applications than the Apple App Store. Just one month after that, based on current growth numbers, the Android Market should eclipse the Apple App Store. As of this writing, Android already beats Apple in the sheer number of free apps available as opposed to total apps available. I’m not exactly sure, though, if that’s good or bad. Is more always better?